Something bright and cheerful for your Monday, whether you’re working or have a day off like many Americans. I’m putting a selection of the new pieces on the blog this week, but there’s even more art at the Floating Gallery and it’s only available until next Sunday! 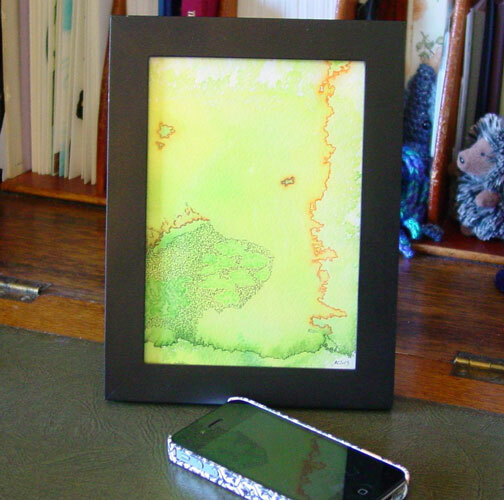 I had a piece of 10″x8″ watercolor paper that I made a background on in bright yellow, green and darker green, using a spray bottle to make the fascinating layered shapes with their fractal borders like fjords. I used pen & ink on this piece a bit haphazardly at first, and what I ended up with was a work of art that just wasn’t working with itself. So, I girded my loins and got out my tear bar and tore it in half, then took a bit off each piece to end up with two 5″x7″ works of art, and a couple of bookmarks. All of the pieces then got some more work, and Edges is one of the results, the right half of the original. 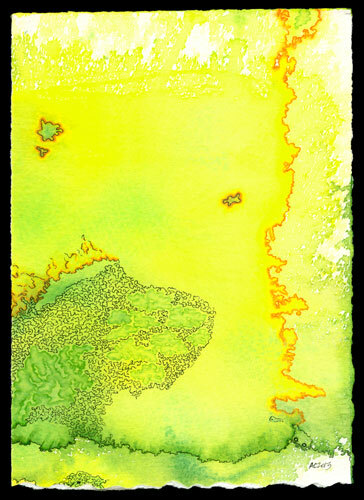 Edges, 5″x7″ pen & ink and watercolor on watercolor paper. 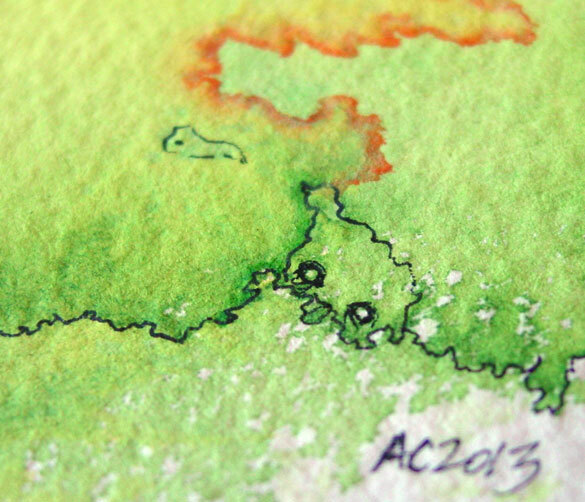 Above, you can see the little critter I doodled in one corner where the edges seemed to suggest him. He’s smaller than a dime, and says pbth on your size issues. Below, speaking of size issues, you can see the piece in a frame with my iPhone, so you can appreciate the size it ended up.